Qt provides a simple interface for building cross-platform system tray (Windows) or menu bar (MacOS) apps. Below is a minimal working example for showing an icon in the toolbar/system tray with a menu. The action in the menu isn't connected and so doesn't do anything yet. You'll notice that there isn't a QMainWindow, simply because we don't actually have any window to show. You can create a window as normal without affecting the behaviour of the system tray icon. The default behaviour in Qt is to close an application once all the active windows have closed. This won't affect this toy example, but will be an issue in application where you do create windows and then close them. Setting app.setQuitOnLastWindowClosed(False) stops this and will ensure your application keeps running. The provided icon shows up in the toolbar (you can see it on the left). Clicking on the icon shows the added menu. Below is a more complete working example using the built in QColorDialog from Qt to give a toolbar accessible color picker. The menu lets you choose to get the picked color as HTML-format #RRGGBB, rgb(R,G,B) or hsv(H,S,V). You'll need an icon to use to run this example — I recommend the fugue icon set. As in the previous example there is no QMainWindow for this example. The menu is created as before, but adding 3 actions for the different output formats. Each action is connected to a specific handler function for the format it represents. Each handler shows a dialog and, if a color is selected, copies that color to the clipboard in the given format. As before, the icon appears in the toolbar. Clicking the icon shows a menu, from which you can select the format of image you want to return. 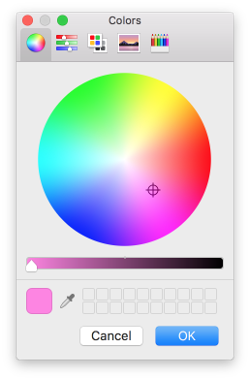 Once you've chosen the format, you'll see the standard Qt color picker window.